Beautifully decorated, exceptionally maintained three bedroom, two and half bath Lakeview Pool Home. Located in privately gated community of Briarwood, this tastefully decorated lake view home has a split floor plan which offers pool/lanai access from the master bedroom, guest bedroom and the living room. The home has vaulted ceilings throughout with ceiling fans, entertainment center, dining room, breakfast room and fully equipped kitchen. The living room has three sliding glass doors that open up entirely to the lanai area with heated pool, outdoor dining and an area for sunbathing. In the evening, the pool is surrounded by soft landscape lights. Perfect for entertaining. The Master bedroom suite has a king-sized bed, walk in closet, private bath with oversized shower stall and garden soaking tub and private lavatory. This room also has a beautiful view and access to the pool/lanai/lake. There are a further 2 well furnished bedrooms. The house is located approximately 4 minutes walk from the Briarwood Community sports facilities; pools, tennis courts, basketball court, sportsfields and playground. 2 sets of complete bedding available for each bed. High speed internet included. Need to work while away? There is also a wireless keyboard and mouse, printer/scanner/fax and large monitor available. Bring your own laptop. Large selection of bathroom towels and pool towels available. Tennis rackets and balls, soccer, basketball, volleyball and American football balls available at house. Briarwood fields and courts only 5 mins walk from house. Adjoining dining area seating 6 plus separate breakfast nook seating 6. Well maintained and landscaped with excellent lake views. Feature landscape lighting gives a serene evening mood. Briarwood community tennis courts are only 5 minutes walk from the house and are excellently maintained. Tennis rackets and balls are made available with the house. 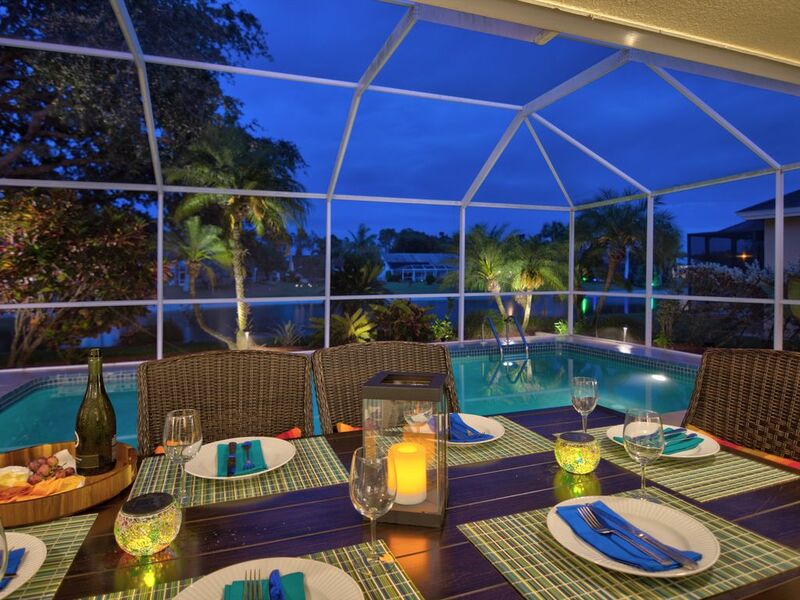 Beautiful views over the lake from the private heated pool, outdoors in screened lanai porch. Naples and surrounding areas have a beautiful selection of clean and family friendly beaches. Included at the house are beach chairs, parasol/umbrella, beach coolers and toys for a fun day out. We rented this house for our, all adult, family of 5. It was very clean and had everything we needed. We used the heated pool a lot and spent most of our time on the lanai. We also appreciated the sports equipment and bikes and used the community tennis and basketball courts. The property is in a central location, close to the beach and several shopping areas. The owners are very good with communication and answered all of our questions, we would recommend this property! Thanks Marc and Anne! Lovely house. Beautiful community. Owners thought of everything. From the pre-stay communication to all of the little things, we were totally impressed. We thoroughly enjoyed our time in this lovely home. It is even more beautiful than the pictures. The owners thought of all the extra touches that make this one of our favorite VRBO rentals. We loved dining on the patio and relaxing while enjoying the lovely view over the lake. It is a very quiet, safe neighbourhood for walking and riding the bikes the owners have provided. We used the beach chairs on our visit to Marco Island beach. We also found a great European Deli and Butcher just around the corner from the home (Pepper's). The location is excellent for heading to the beach, 5th Avenue, golf courses and shopping areas. Thank you to the hosts for opening up their home to us for a wonderful vacation. This house just feels like home. The owners were helpful, easy to contact, and well organized before and during our stay. They have thought of everything you could need. The home is beautiful and in a great neighborhood. We will definitely be back! This home is immaculate and has all the amenities you could ever want or need. The homeowners were wonderful answering all our questions promptly. Quiet neighbourhood and we would definitely stay again.